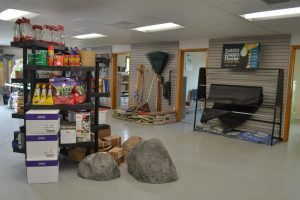 In addition to our bulk supplies, Mulder’s Landscape Supplies also carries an array of miscellaneous supplies which appeal to customers undertaking both large and small projects. Fire Pits – Our full line of Lakeland fire pit block includes swing grates, metal fire ring, and capstone accessories. Tools – We carry a wide variety of Wolverine tools & wheelbarrows. ADS & NDS Drain Supplies – Our 4” hose is available in solid, perforated, and perforated with sock options. We also carry all related accessories. Special Projects – Need a pool filled in, dirt hauled off a job site, or any other type of project? We can partner with you to get the job done. Contact us for more information and pricing. Demo Jobs – We can assist in the demolition of houses, barns, etc. Contact us for more information and to discuss your project. Weed Barrier – Available in widths of 3-12’ per fabric roll, 250 and 300’ lengths are available. We also offer a few options by the foot for smaller projects. Ice Melt – We offer ice melt for all your application needs. Contact us for more info or visit us to learn more about your next project. Our customer service representatives can help with any landscaping project you’re looking to undertake.